The pattern is finally available for purchase! I went into my photo archives to find the pictures I took when I finished knitting Fern, and couldn't believe it was back in February. Ah well, a few other things got in the way in the last almost-half year. Il modello e' finalmente disponibile per comprare (ma purtroppo non in Italiano--mi dispiace). Andavo nel mio archivio fotografico per trovare le fotografie che ho fatto quando finivo Fern, e non potrei credere che era in febbraio. Allora, alcune cose hanno intervenuto nel ultimo quasi mezz' anno. Panels of Fern Pattern lace (from the Mon Tricot 1500 stitch dictionary) form the side sections of this fitted sleeveless top, and cause the hem to curve gracefully. Binding off and then picking up stitches just below the bust creates an accent cord, above which gentle bust shaping (short row shaping optional) and a scoop neckline create a flattering silhouette. The neck and hem are finished with an applied I-cord edging, while the armholes are self-finished (see Pattern Notes). Intermediate: skills used include reading chart, picking up sts, three needle bindoff, attached I-cord. Jo Sharp Desert Garden Aran Cotton, 65% cotton, 35% microfiber, 60 yd/55 m per 50 gm ball, 7 (8, 9, 10, 11, 12, 12) balls. US size 8/5 mm circular needle, 24-47” depending on selected size. US size 8/5 mm set of double-pointed needles (dpns), for neck edging. OPTIONAL: US size 8/5mm 16” circular needle for neck edging. 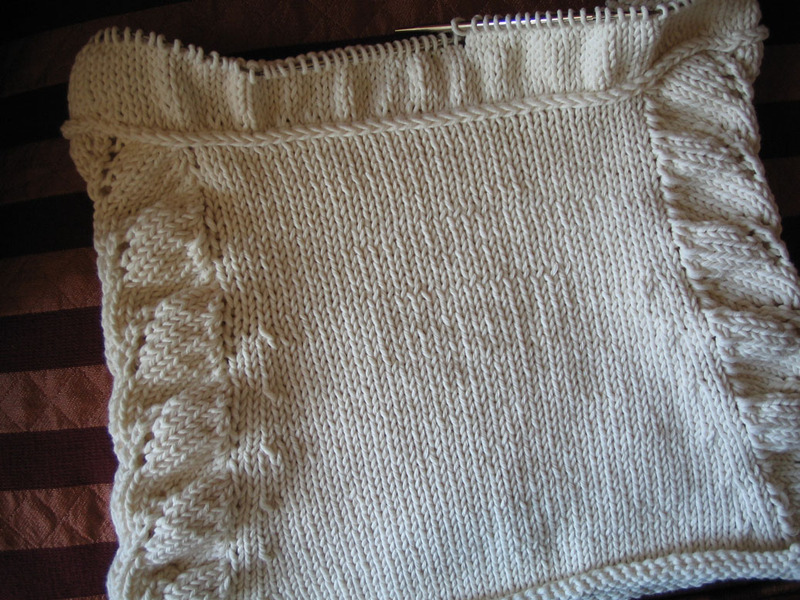 16 sts/22 rows to 4”/10 cm in st st; 28 sts to 5.5”/14 cm for Fern Pattern. Check gauge on blocked swatch. This top is intended to fit closely; however, the lace panels are very stretchy, so that even with zero ease, the fit is somewhat forgiving. In the pictured top, the length from bra band to hem is 11-12 inches/28-30 cm (the hem curves slightly) for all sizes; changes in overall length for different sizes all occur from the chest up. However, directions are also given for lengthening the portion of the top below the bust by 2 inches/5 cm. Read through all instructions before beginning, especially if you plan to change the length below the bust. 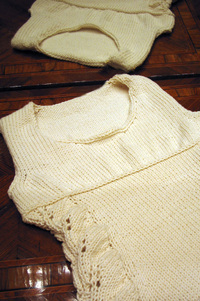 Note that in the pattern, unlike the pictured top, the armholes are self-finished with Annie Modesitt’s slipped stitch edge; this reduces rolling of these edges, as well as finishing time. Click here to purchase! Included are all written instructions, schematic, and Fern Pattern chart; after purchase you will be emailed a link to download the pattern in pdf format. Fern is at the stage where I'm not sure how much of her will stay and how much will go; an obvious (in hindsight!) result of the curve of the lace panels at the hem is that they also curve at the top--a curve which may or may not look odd. I'll probably need to try blocking and see what happens. My stitches are usually more even than this; I think the reason may be that the Jo Sharp Desert Garden Aran Cotton has a lot of twist and sometimes kinks up on itself. I've been trying to let it untwist but it's a constant (and losing) battle. Mi permetti discrivere questa camicia: Fern dal orlo al busto, con i pannelli di "Fern Pattern a ogni lato. Ho usato le diminuzione per formare la cintura, e volevo che questa camicia va bene sotto il busto. Mi dispiace, ma non so come si dice "bind off," "pick up stitches," o "stockinette" in Italiano. Non so quanto di Fern restara` and quanto andra`; con il senno di poi, e ovvio che i pannelli vedrono magari strani. Dovro` provare "blocking" e vedo che e` succedera`. I decided that the two hats I pictured in my earlier post, although similar, are different enough that they each deserve a moment in the spotlight (so stay tuned for "Falling Leaves"). I delayed putting these patterns up because Kerrie at MagKnits was kind enough to feature another of my hat patterns in her June issue, and I didn't want to compete with its release (even though "Rose-of-Sharon" is very different from the others). The Beaufort wind scale allows sailors to estimate wind speed; at 19-24 mph (a “fresh breeze”), waves are topped with whitecaps, and foam begins to spray from their peaks. (For those landlocked, small trees sway!) The color and pattern of this hat remind me of billowing whitecaps, and the yarn—a cotton-microfiber blend—is suitable for a chilly afternoon on the water, even in mid-summer. Edited to add: Heavens! How embarrassing. I just realized that the pdf directions are for Beaufort without a ribbed edging, which I intended to include as an option, but which is not as the hat is pictured. As pictured: cast on as directed, then work approx 1(1, 1.5) in of 3X3 ribbing (P3, k3; rep to end of rnd) before starting stitch pattern. FIXED! Click on the link above for the corrected pattern. I would imagine that a hat is one of the last things on the average knitter's mind right now; it's a gorgeous spring day, and my thoughts are certainly turning to, if not knit bikinis (never! ), then sleeveless, short sleeves, lace--that sort of thing. Well, this hat is kind of lacy, anyway; I've decided I like lace patterns for hats because they get stretched on the wearer's head and display the stitches nicely. As simple as this little number looks, it has gone through a number of alterations; I added the ribbed edging so it grips the head better (although I'm also working on a version that has no ribbing), and I re-worked the crown decreases probably a half-dozen times. I think what I've ended up with carries the pattern nicely to the top. I used the "spiral" pattern I found here. The yarn is Jo Sharp's Desert Garden Aran Cotton, color "Solstice". I like this yarn a lot; it's an aran weight blend of cotton (65%) and microfiber (35%), and springy and soft to work with. When I finish the version without ribs (and in which I tried using SSKs instead of k2togs), in Jo Sharp Silk Road Aran "Merlot", I'll post both patterns gratis (the only real work involved was figuring out the decreases, which I take a geeky pleasure in doing anyway).